There is nothing wrong with being inspired by other Designer’ work and it can often lead to even more creativity in one’s own designs. Traveling can be one of the best ways to get inspired and stumble upon new and exciting styles. Sometimes its checking out newly opened hotels or restaurants in your own city, or through worldly travels, or even just by flipping through design magazines or scrolling through Instagram. As long as you have your eyes open, the inspiration is endless. Below are a few spaces that have got us swooning this month. A transplant from New York, the new west coast version of the Nomad Hotel stands where the old Bank of Italy was in Downtown LA. They lovingly kept the exteriors neoclassical architecture in tact but combined it with unique and modern renovations on its interiors. The guest room styling is distinguished through traditional crown moldings and roman shades juxtaposed with modern furniture profiles and bold fabric choices. 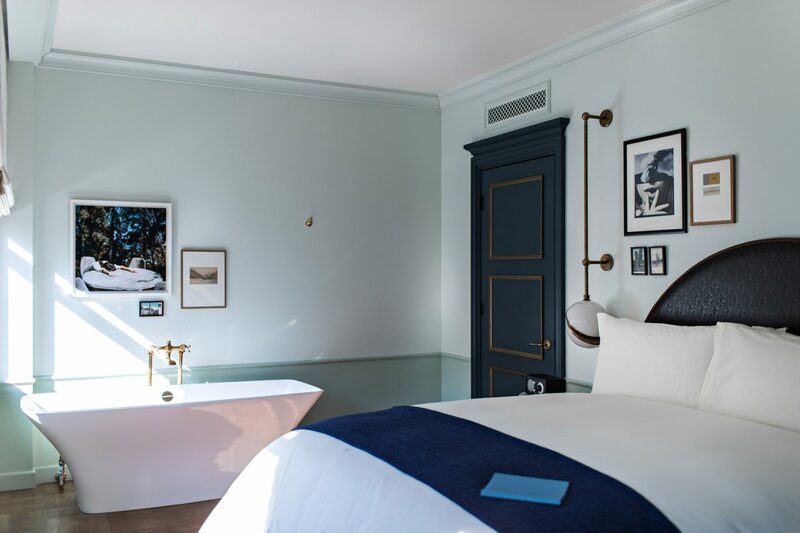 The adjoined bathroom is beautifully minimalistic but with a luxe feel through bold marble counters and gold plumbing fixtures that speak to its historic downtown site. Located in Northern Italy is the 18th-century estate owned and designed by icon, Marella Agnelli. The estate is a Maximalists paradise achieved through her impressive blending of multiple different aesthetics and use of rich patterns and textures. 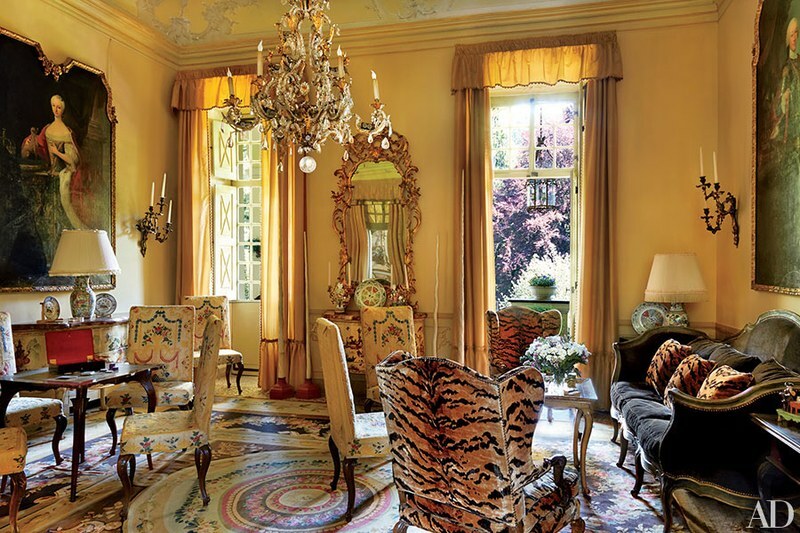 Her Salone da Gioco has a regal vibe, with gold as the central color, covering the room entirely from the walls to the valance curtains, embellished with polished accents found in the framework and Venetian mirror. Animal print chairs are tied together with corresponding throw pillows opposite a black velvet sofa, cohesively blending with the French antiques throughout. The incorporation of Piedmontese portraits and neoclassical chandeliers is rounds out this exceptionally collected and individualistic space. Though it’s a bit wild for most, there is plenty of inspiration to be found that can be applied in smaller doses for an easier attempt at this aesthetic. 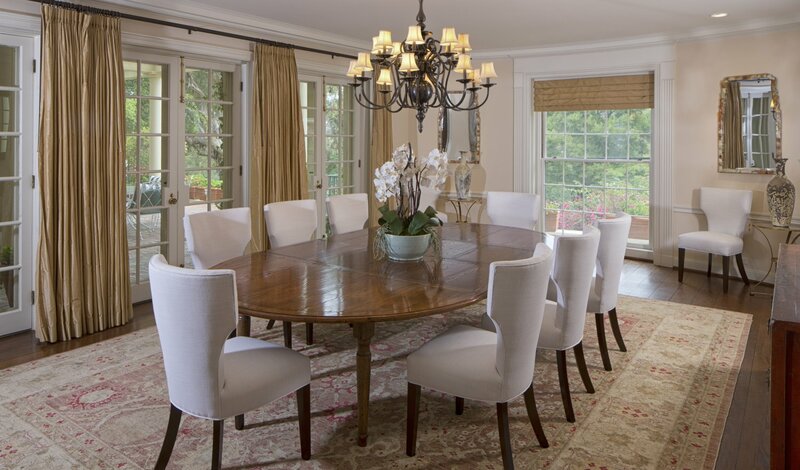 Taylor Swift keeps things simple and elegant within her traditional-styled home. Southern charm meets Beverly Hills in the young musician’s house and perfectly suits her style. The dining room shows off her love of antiques and traditional aesthetics. It’s refreshing to see a young star with such mature taste and it reminds us that classical pieces are always in style. Formal furnishings can feel dark and heavy, but the light colors and windows throughout keep the house feeling young and fresh, fitting of the home’s owner.